So, here I am in Madrid for the EPT Grand Final and I’m proud to say that I have actually managed to go out and see a bit of the place, rather than just staring at the inside of a casino all the time. Doesn’t that look lovely and peaceful? All perfect, green and healthy like something from an advert. It also cheered me up to see this lovely glowing yellow shop. But, the next day, I was rather disappointed in the heads up tournament. I beat my first opponent (an American chap called Ali who beat me in the heads up at the PCA) 2-1. I beat my second opponent, English poker wunderkind Toby Lewis, 2-0. My third opponent - this time to get into the money - was James Akenhead, who made the World Series of Poker final in 2009. No easy rides here, it seemed… and James won 2-1. I’ve played four major live heads-up tournaments in the last year, and EVERY TIME I’ve finished on that perfect bubble, 2-1 down in the money match. I definitely need to think about whether there’s something I do at that stage without knowing it; do I unconsciously tighten up in the final stretch, or gamble too much? It feels like I’m playing the same as usual, but four finishes in that exact spot is no longer feeling like a coincidence. Further disappointment came when I happened upon a HAM MUSEUM that turned out to be a boring old butcher’s shop. Come on, I don’t speak much Spanish, but wouldn’t you have assumed this was a ham museum? On day four of the series, I cashed in an event: the €500 ladies’ tournament. Readers of my Guardian poker column will know that I’ve come round to the idea of women-only tournaments, having been persuaded by many newer female players that they find them a fun and un-intimidating way to get into the live game. Anyway, I tried one at the PCA in January and finished fourth for about $10,000, so that was bound to make me more in favour… In this one at Madrid, I finished third (of 60 runners) for €4,100 and it was just as good fun as last time so I’m glad I played and will probably try these again. Are you wondering why we’re so far into a post titled “holiday snaps” and I haven’t yet shown you a photo of an amusing translated menu? Ah, the staple… somehow always funny, even as we know what a terrible job we’d make of translating an English menu into any other language at all. Okay then, here’s a question. Let’s say you fancied some fried fishes. 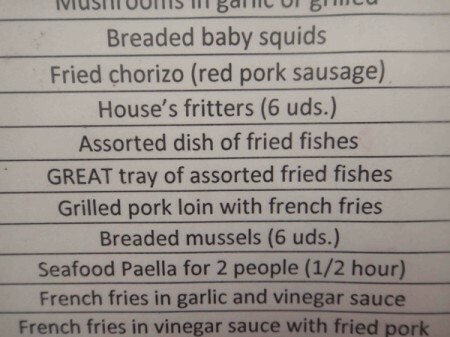 Which fried fishes would you choose from THIS lovely tapas menu? I mean, why would anybody choose the other one? There’s a grand park near the hotel, in which I went for a healthy stroll and not-so-healthy ice cream with my old cohort Neil “Bad Beat” Channing. How beautiful are these trees? They’re even lovelier than the yellow shop. I was also tickled by the local habit of wearing interesting costumes in town squares. I’ve seen it in other European cities; people wander about in colourful or themed outfits, and tourists pay a euro or two to have photos taken with them. I just enjoy turning a corner and seeing something quite unexpected on an otherwise ordinary street. But then there was the goat. I found the goat TERRIFYING. I gave it a euro and it snapped its jaws at me. If I was a child, it would have given me nightmares for months. Neil thought it was a horse. I think that’s a sign he’s been having too many bets on the racing. It definitely isn’t a horse. It’s a goat - or possibly, looking especially at its shadow, Satan. Whatever it is, it might be the most sinister thing I’ve ever seen. But apart from the goat, Madrid is lovely. It looks more like something from Dr. Who to me. I’d have had the Great platter of fishes too. There I go, assuming that you would have had the Great platter of fishes. Were they Great? 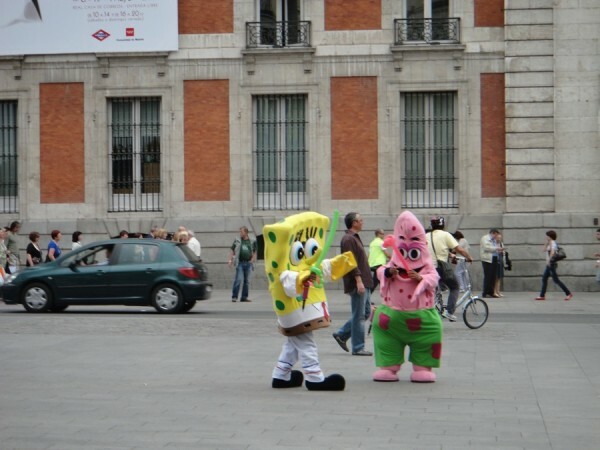 I think you bumped into Spongebob Squarepants and his chum Patrick. Regarding the heads-up bubble thingy. I watched you do exactly the same thing, from the virtual rail, in the $1500 SCOOP heads-up. You didn’t appear to do anything wrong. You were just plain unlucky. He’s short stacked with a pair of 9’s on the flop against your pair of queens. You put him all-in and he calls. Anyone with half a brain cell knows that they’re behind, against you, in that situation. He rivers a third nine to double up and then, to give him credit where credit is due, never took his foot off the pedal. He steamrollered you, when your head must have been spinning. Anyway, AMAZING pictures. But that goat makes me sad. It has such a vacant look in its eyes. Plus, it looks like the scary bunny thing from Donny Darko. All it needs is a nice friend to recommend a razor and I bet it’d be the coolest goat in school. Even if only by process of elimination. Hi lala. The chap didn’t have a pocket pair of nines, he had a 9 in his hand and there was a 9 on the flop. I can understand why he’d find it hard to fold here - it’s not easy to make a pair, he’s beating AK, all smaller pairs and all bluffs - though Andy’s right I did bet like I had a big hand, which was top pair (queens) so was more than 4/1 favourite. But he hit and, yes, I managed to be on the bubble of the Scoop heads up as well! But those matches aren’t best of three so it didn’t feel so much like a pattern, just unlucky. PS. You’re right, a pocket pair of nines is near impossible to pass heads-up, unless the stacks are really very deep. It would take five bets before you even thought about it! Did you find the bar that is also a butcher’s? You can have a beer, smoke a fag and order your Sunday joint all whilst sitting amongst slabs of dangling meat. Goodness, sorry about my comment last night, I’m such a dolt. Will revert to being an observer here, haha. Thanks for clarification though Victoria. Personally I hate pocket pairs, but QQ seems to be lucky for me - I once managed to make a man who’d paired his Ace fold to my Queens. It was a good day. I’ll censor myself to save someone else doing it - f*****g idiot. I know it was late but he calls instantly with K2 not knowing the Coren stack has doubled up?! Having played for 47 years I had that horrible horrible feeling in my stomach what was going to happen. I just don’t have the class to be able to take those beats like I should. Hate to see it happen to others too. 13 hours bloody hard work effectively wiped out. Sick. Madrid is lovely—Apart from the goat. I think they should put that on their license plates. I got a suggestion for you to write about. A lot of man seem to be attracted to You. I don’t know if You can write down what exactly it is. What lip-stick or hat or giggle does it. And write it down so that nerdy girl also gets it. I don’t think you know that you think in the way you do (never mind why) but you may but have kept it secret. It’s not the kind of psychology you learn playing poker, not that it teaches you much about psychology. Would you like to go on a day course at RR’s Dream University (lunch included)? It could help you solve mysteries. I hope you managed to see some art Miss Coren! Vicky, good Obs column today but your anecdote about “a small misunderstanding” when buying records in Our Price was informative and not in the way you think. You counted out some money, walked out of the shop and then had to go back in because you’d only paid for one of the two albums and afterwards you felt so embarrassed that you wrote “I WANT TO KILL MYSELF” in “The Book of Horrors”. However, how did this happen when the guy behind the counter should have entered the prices of both albums into the till and asked you for the correct amount in the first place so you would count out the correct amount? I’m not saying the story isn’t true. I’m saying that you misunderstood the misunderstanding then and now. Do you see what you and the guy in Our Price did psychologically?